I’m not surprised, given how far north you live. In contrast, down here we’ve had another of our rather mild winters, even if the overnight temperature dipped to 38°. Now it’s dropped to 35° with overcast skies and a brisk breeze. This morning is a reminder that winter isn’t done with central Texs yet. Hooray for the return of the bluebonnets. Lovely to see them via your photos. And of course I’m pleased to be able to show them to you. This may be the earliest in the year I’ve ever photographed any bluebonnets. The rock for a background was a nice touch. When I touched it literally with my left hand, orange clay from its surface clung to my fingertips. I had to rub them clean on the grass before I dared hold the camera again. Wow, so the rock infused your efforts that day in more ways than one. Yes, it infused my efforts. I refused to be confused by the clay on my fingertips. By rubbing I diffused the concentration and defused the situation. I guess you could say you rocked the moment. You nailed it stone cold. My gaillardia send regards to your bluebonnets. That second photo is one of the most unusual and creative presentations of a bluebonnet I’ve seen. I really like it. In a world given to fields-of-bluebonnets photographs, the poor rosettes get short shrift, and this presents them as equally beautiful. Bluebonnets back to gaillardia: message received. As you appreciate, the more we photograph a species, the harder it becomes to find new ways to do it. On the other hand, says the math teacher, the possibilities are literally infinite, so persistence brings rewards. Given the way bluebonnets have been “done to death” in Texas, new ways to present them are especially gratifying. The second picture was one of a bunch I took showing a developing inflorescence with leaves around it. Speaking of which, I don’t remember noticing till yesterday that some of the leaves, like the one behind the developing bluebonnet, have unusually dark centers. As delighted as I am with the year-round blooms of flowers, bushes, and trees in my part of New Zealand, there’s nothing that warms my heart and makes me smile like seeing bluebonnets. Nothing. Thanks for these, Steve. From half-way around the world, you’re welcome. I didn’t detect much aroma yet, but we’re only a week into February. It does seem really early. You’re right that it’s still really early. Yesterday’s patch included many more bluebonnet plants that hadn’t yet blossomed than those that had. I had to walk gingerly to try not to tread on them. I think our society has moved up a notch in priorities when the first bluebonnets make the news. Bluebonnets are a big thing in Texas (in some ways too big), so it’s not unusual at this time of year to see reports of the first ones that people find flowering. I’m with you in wishing that newscasts consisted mostly of wholesome, inspiring stories, rather than disasters and endless political bickering. Wow, those are pretty! You can’t imagine how nice it is to see spring flowers! We are headed towards zero tonight with several inches more snow coming. We had a Texas version of a Montana day here: temperatures in the mid-30s and even some little pellets of crystallized drizzle. I don’t think it hurt the developing plants but I haven’t been out to look. This was the first and only exotic lupine I ever wanted to grow. The Texas A&M red bluebonnet started to become available at about the same time all the weirdly colored California poppies became trendy. How lame; red bluebonnets. There are some things that should not be tampered with. I agree. Let bluebonnets be blue(actually usually purple)bonnets. This species has a natural white variant that’s not uncommon in central Texas. Such beautiful flowers. The colors are so rich. As the state flower of Texas, the bluebonnet has been done to death, pictorially, so I’m always trying for new takes on a hyper-familiar subject. In the first image I gave primacy to color. Lovely, Steve. Spring is just around the corner. You can say that again. In spite of 36° here this morning, the sky is clear, with the high temperature predicted to be 67° this afternoon and 73° tomorrow afternoon. Today is similarly springy in Colorado Springs. 20s at night, high of 60. I am actually watering the lawn, as we have had very little precipitation this winter. I sure wouldn’t have expected 60° in Colorado Springs in mid-February. It’s hard to imagine watering the lawn there at this time of year. It is not unusual to get short periods of warm weather along the Front Range, but in combination with drought and winds, they spell trouble. Red flag warnings, and the risk of wildfires! Nice. 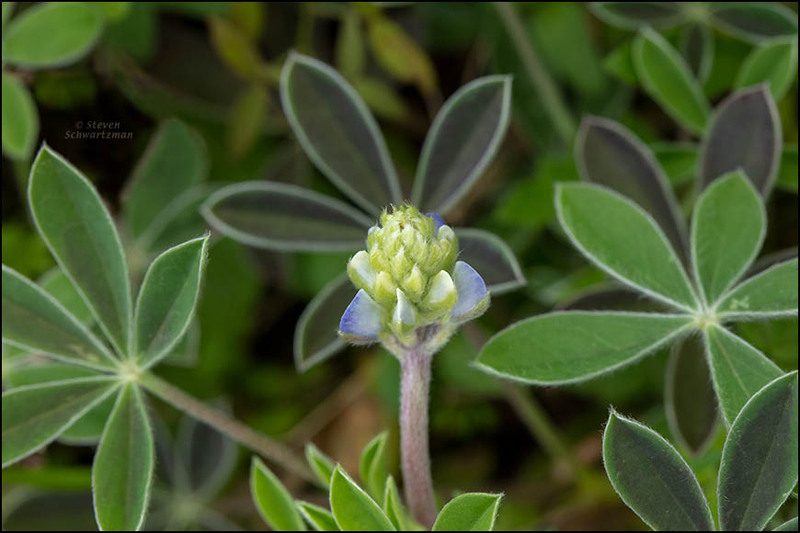 I had never noticed, not having seen many, that Bluebonnets resemble lupines both in flowers and foliage. 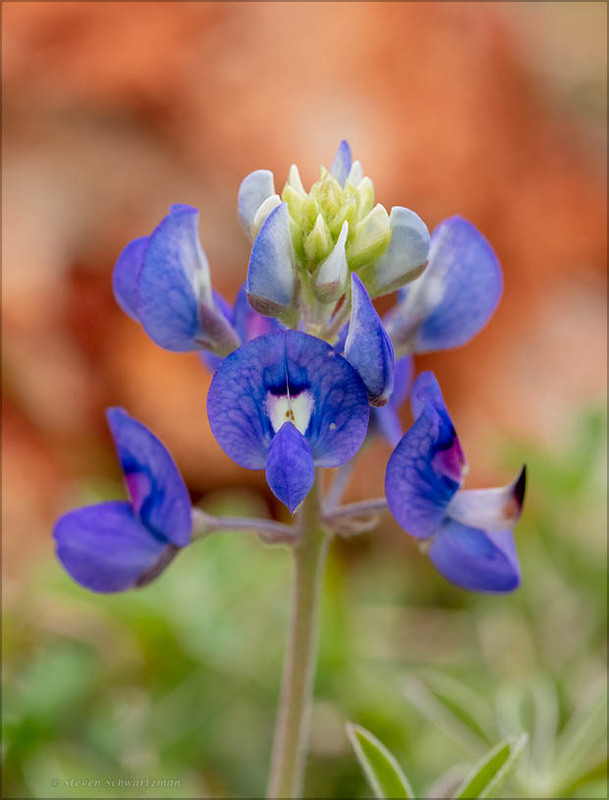 Technically speaking, bluebonnets are lupines, so that accounts for resemblance in flowers and foliage. We went back to this spot yesterday and I was surprised that the colony looked about the same as on February 7th. I’d hope more flowers would’ve come out by now, but the cold spell we had might account for that.